Absolutely nothing! This design is just a refresh to replace obsolete components from the 4.2 design: the 4-way switch and the original Raspberry Pi form factor. The new design is thicker but less wide, however the overall volume (with case) has increased from 339cm3 to 371cm3. The design sports 4 individual buttons instead of the single 4-way switch and use common 12x12mm tactile switches which are available from a variety of sources. 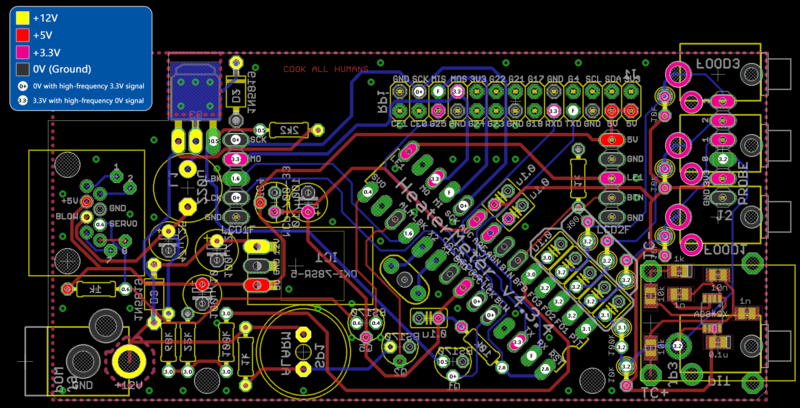 Much thanks to Kevin Akers who redid the base board layout from scratch! All the schematics and EAGLE files are available from the GitHub Project as well as the above link. A 3D printed case source file is also there. Troubleshooting images and assembly videos are coming as I churn them out. I've spend a week and a half just generating all the documentation, projects, BOMs, illustrations, and as always everything HeaterMeter-related is faster and more fun. The case design is up on Thingiverse where you can customize it to fit different Raspberry Pi and Thermocouple/Thermistor options. Printed cases are also available in the HeaterMeter store. It only took this many tries to get it where I liked it. HeaterMeter v4.2 is still active and I'll be continuing to stock v4.2 in the HeaterMeter store at least until the software support for newer Pis is complete. Here's some voltage debugging. The base board is a thermocouple PCB with a default configuration and with no probes plugged in. For a 4-probe thermistor version, all the probes will read the same 3.3V and 3.2V closer to the microcontroller. Then plug in a probe into the Pit jack and the blower should turn on (the default setpoint is 225F so a room temp probe should activate it I think? Might depend on the probe model). The "1.4*" on the LCD board is the contrast pot adjustment, so that should be in the 1.4V ballpark but the same voltage at the two points. Last edited by Bryan Mayland; 02-08-2018 at 06:40 AM. Added a link to the 3D files on Thingiverse where you can customize the case with what options you want. I bet I could make one with no LCD/buttons too but that's further down the road if people ask for it. That's awesome. I might like to build anther just for fun. Any reason why you cant use the 4.3 on an original Raspberry Pi B? I think the main reason for the HMv4.3 is to add newer model rPi support because the rPi model B is getting hard to find. Since there are no real upgrades in HMV4.3, just newer rPi support (for the physical connection), I would think if you already have a rPi Model B you should just build a HMv4.2 board for it. In the end you will have the same thing functionally, the HMv4.2 is a time tested design that has outstanding performance. Great job Bryan and Kevin! This is awesome! Can't wait for the v14 software to come through. I built a few 4.2.4 units this summer and those Pi's are really getting harder to find. I managed to get my hands on a couple of pi zero's but their USB cable/port was hard to cram into the case. I've updated the case design a little on Thingiverse. Some minor tweaks to help the two halves come closer together, and a some lips around the inside to align the halves and keep them from sliding laterally. Will be in github on the next push. Hi Bryan, I recently put together a HM 4.3 which I purchased from your store, followed very detailed easy to follow instructions, unfortunately the thermocouple output is not working. I have used it for a couple of cooks with the other probe jacks, which is fine, but I would like to rectify the issue. I ran across some trouble shooting for the T/C on the 4.2 version which was done in an incomplete state. Would you be able to provide similar test points/values for a completely assembled 4.3? Thanks in advance for any assistance you are able to provide. Can you describe in more detail what's not actually working? Are you getting any readings? In the web config, have you changed the probe type from Internal to Thermocouple?